In addition to Scaletron scales and Carus treatment chemicals, we stock Red-B-Gone solution for rust discoloration treatment, as well as reagent chemicals and water testing kits from LaMotte, Bright Dye liquid and tablets and Leak Detector toilet packs for homeowner leak detection. CARUS offers a full line of water system phosphate treatments to control corrosion of old piping and minimize rust and other mineral discoloration. Scaletron’s series of cylinder scales is designed for measuring liquified gas cylinders up to 12″ in diameter. Scaletron’s gas cabinet scales are designed for measuring liquified gases stored in cylinders up to 30″ diameter. For measuring corrosive chemicals in drums, Scaletron offers these low profile, corrosion resistant scales, capable of measuring up to 10,000 lbs of material. Scaletron’s Tank and Platform scales are designed to measure corrosive chemicals in weights up to 10,000 lbs on low profile platforms that can either weigh free-loaded or secured containers. 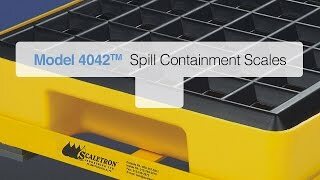 Scaletron’s spill containment scales isolate the load cells underneath and completely protected from the containment basin. That means lower maintenance costs and longer life for the scale.